Sevens (Politiko) :: Pete Seeger, Turn! Turn! Turn! Protest songs and politically framed ballads are almost immediately associated with Vietnam-era musicians. Or maybe it’s that those musicians are almost immediately branded as subverters of a cultural paradigm during such a seachange in the American substance. Nonetheless, their words and countercultural display of freedom marked a shift in artistic expression. They not only popularized free will and seditious language, but they made it seem cool. And they inspired change. That said, it could be fairly easily argued that the progressive and pervasive musical environment then begot the accessibility and diversity of music now. But even their progressive nature wasn’t an immaculate conception of sound. We pay lip service, probably more often than we should, to the evolution of blues, the birth of rock, the British Invasion and so on until you turn on the radio and hear what you hear. And that’s sort of a lazy way to chart the growth of popular noise. But for whatever reason, we tend to think that subversive folk, sort of the granddaddy of powerful lyrics, sprouted organically from a field of sage with a guitar strapped to its back, a harmonica pressed between its lips and a library of poetry incubating between its ears. It’s a silly and narrow notion, but the popular view–maybe not yours or mine–is that Dylan-esque folk is not derivative, but only that by which music is derived; has not been influenced, but has only been influential. But folk music didn’t spontaneously lose its innocence in the 1960s. In the ’40s, Pete Seeger and Woody Guthrie’s the Almanac Singers sang explicitly of racial inequality and extensively about union organizing. Their casual stage attire and communal live-performance approach was anathema to the conservative musical context of the time, underpinning the contrarian message they delivered. But their association with leftist groups, including the Communist Party USA, led to their demise as McCarthyism‘s suspicion-mongering claimed more and more innocents. 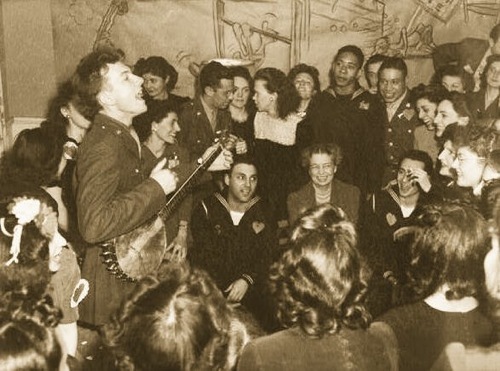 By 1948, the Almanac Singers were no more, and Seeger and Almanac bandmate Lee Hays formed The Weavers. Still intent on delivering protest songs, but trying to avoid any social and political backlash, The Weavers donned tuxedos, buttoning up not only their look, but their live shows, as well. More importantly, though, was their approach to songwriting. Any sign of protest in their songs had to be veiled in euphemism and metaphor to curb a potentially volatile reaction, a theretofore rare practice. The trick, however, was met with controversy. Audiences who sought fist-raising labor songs felt betrayed by The Weavers’ wholesome facade and refusal to sing more divisive lyrics publicly. Right-wingers and anti-Communists saw through the ploy, and blacklisted them anyway. The group disbanded just four years later, but importantly, their songwriting style remained. “Turn! Turn! Turn!” is, almost verbatim, the opening of Chapter 8 of the Bible’s Book of Ecclesiastes, set to music. The Limeliters, of which The Byrds’ Roger (formerly Jim) McGuinn was a member, released the first version of the song, and The Byrds famously harmonized it again in 1965. But even though Seeger wouldn’t release the song himself until months after The Limeliters, it was he who first adapted the Bible passage in the mid-’50s, and it was his adaptation that those other bands performed. At its heart, “Turn!” is about the absolute nature of change. Lives are never static. Happiness is never constant, but neither is dread. “Peaks and valleys” is the accurate, if trite, expression of life’s topography. Because change is a pairing of opposites: birth and death, gain and loss, love and hate, as the songs goes. That dichotomy, the kind of yin and yang of emotional existence, is juxtaposed with quiver of Seeger’s delivery. He is at once despondent and hopeful; despondent because negative change is inevitable and hopeful because even difficult seasons will turn for the better. While The Byrds’ airy, honey-dipped rendition is certainly beautiful, it seems almost too wispy and light to capture that yearning desire for and reluctant acceptance of change that is so striking in Seeger’s voice. Imagine, if you will, 1950s America, when he adapted the song. McCarthyism was waning, but public sentiment was rife with Cold War paranoia. The suburbs were being prepped as future war zones, with bomb shelters going up like picket fences. After spending eight years in two different wars since 1941, 1955 saw an American puppeteering (and rigging) of Vietnamese presidential elections along with the very first U.S. troop presence there. And we all know how that turned out. See, the pairing of opposites–change–might be constant, but for some reason, the global community likes to disregard the notion of change when it comes to war. For love there is hate, we’re born and then we die. But we are perpetually at war with one another, peace be damned. If it isn’t a war of guns abroad, it’s a war of ideologies at home. There are financial wars and religious wars and political wars crackling in every town in America, and it’s never more painfully clear than now. Factions have even been assigned colors so the enemy knows who to attack and the allies won’t shoot down their own. We’re red. We’re blue. We’re black. We’re white. We’re wealthy. We’re poor. We’re Christian. We’re not. Somehow, we manage to balance the rest of our lives with change. Spring warms to summer, summer sheds to fall, fall cools to winter, and then blossoms greet us all. There is a season waiting for us when this one ends, and we usually greet it accordingly. But we haven’t yet managed to accept the season of peace–peace from blood, peace of mind, peace with each other. The one season that should, in fact, be a never-changing constant. Seeger can accept peaks and valleys in life, but he has trouble accepting the idea of that life is an endless battle. He swears it’s not too late to change that. That was five decades ago, and here we are more torn than ever. MP3: Pete Seeger :: Turn! Turn! Turn! Excellent post and very true. Hail the subversives! You may want to edit “Turn! Turn! Turn!” is, almost verbatim, the opening of Chapter 8 of the Bible’s Book of Ecclesiastes, set to music. It’s from opening of chapter 3.